Egyptian prosecutors ordered the detention of labour lawyer Haitham Mohamedain for fifteen days, while they investigate serious charges against him. Haitham is one of at least 100 activists seized in a series of security raids aimed at stopping the growing momentum behind protests over the handing over of Red Sea islands Tiran and Sanafir to Saudi Arabia by the Egyptian government. A coalition of opposition groups and student movements is calling for protests on 25 April. 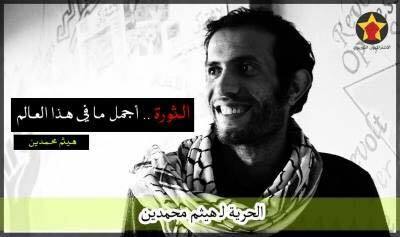 According to prisoners’ rights group Freedom for the Brave, Haitham is currently under investigation for alleged membership of the Muslim Brotherhood, for attempting to overthrow the regime and for calling for illegal demonstrations. Haitham is one of Egypt’s best known labour laywers, and an activist with the Revolutionary Socialists. He has worked tirelessly to defend striking workers from attack by the police and army. He was arrested previously in September 2013 while en route to represent steel workers in Suez who had been arrested after the police attacked their sit-in, sparking an international solidarity campaign supported by the leaders of most of the UK trade union movement.